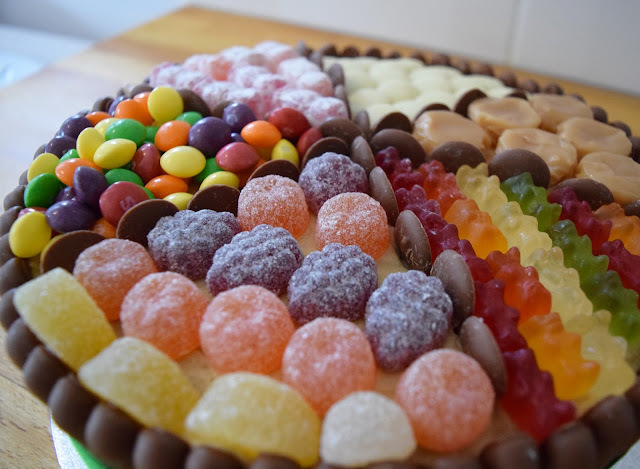 A few weeks ago it was my nephew’s 8th birthday and as has been tradition for the past few years he asked for a cake instead of a present and this year’s choices was a Sweetie Cake. Now Mr O is not a fan of icing and the more traditional “celebration cakes” but he’s a boy who definitely knows what he wants and likes – last year he asked for banana bread! I asked him what flavour he would like and came back with caramel sponge; no traditional vanilla or chocolate for this boy! I’ve made caramel flavoured sponge before but I wanted to see could I make it without adding caramel and how different would the flavour be. Instead I added light brown sugar to the mix and it worked a treat. The flavour wasn’t as strong, much more subtle in fact but with so much going on with all the sweeties on top it was ideal. 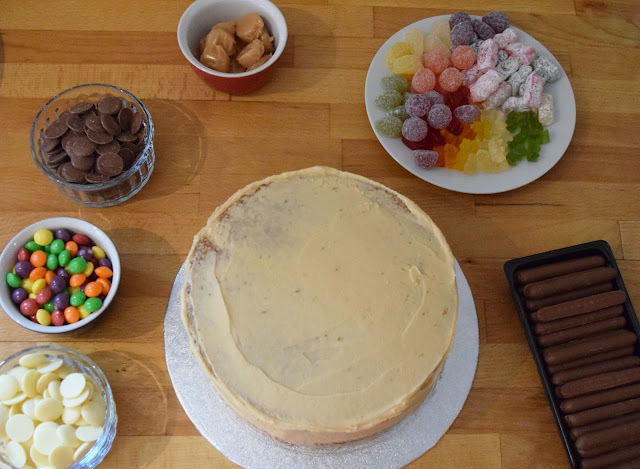 The only thing I didn’t factor in was cutting a cake that is laced in sweets – cutting through jellies and toffees is hard! 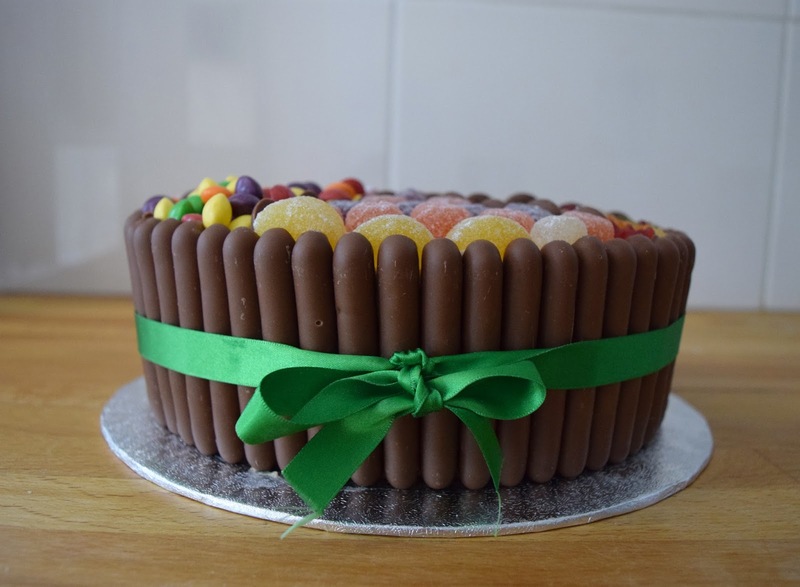 This is such a simple cake to make though and you can decorate it however you choose. Mr T actually decorated this one (he said it was the Uncle’s job) and I’m so pleased with how it turned out. 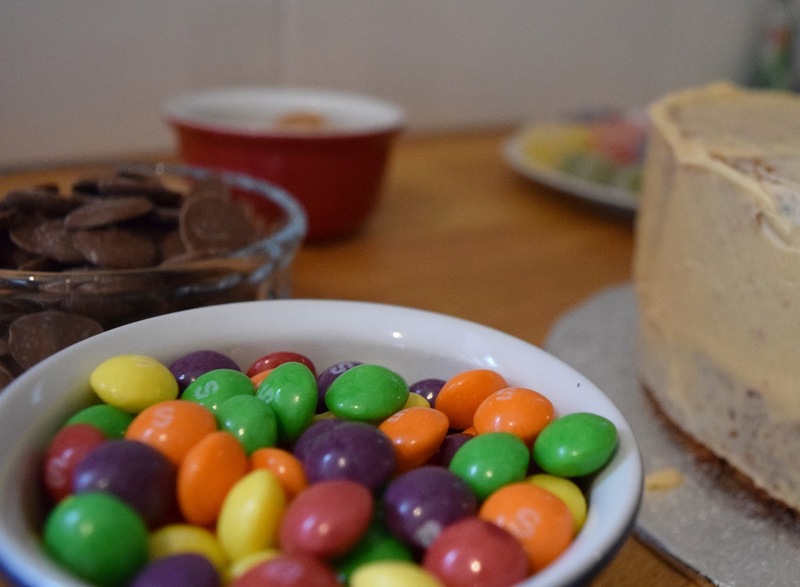 I did debate about making it into a piñata cake too but even I know my limits with covering a cake in sweets and adding a load of hyper 8 year old boys into the mix too! Cream the sugar and marg until pale and fluffy. Add a tablespoon of flour to stop the mixture curdling. Add the remaining flour and baking podwer and whisk until well combined. 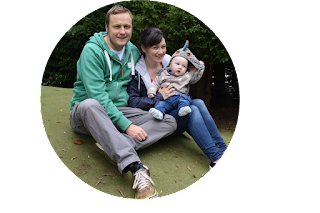 Bake in the oven for 25mins or until a skewer inserted comes out clean. Sandwich the two cake layers together with some buttercream and some more caramel. Coat the outside in the remaining buttercream and press chocolate fingers to the sides before it starts to firm up. 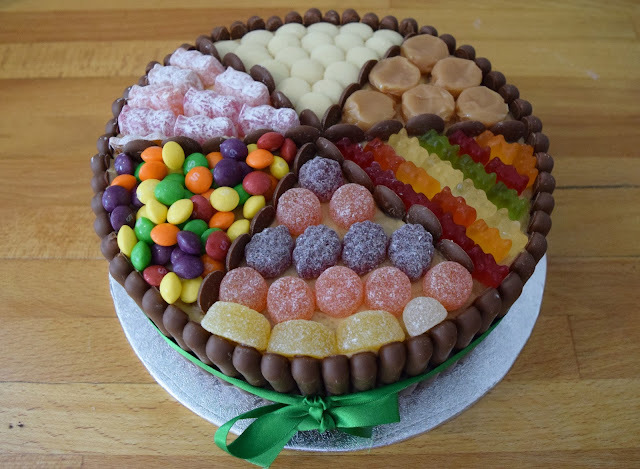 Decorate the top with the sweeties of your choice.